… where our food comes from. Resource of the week! 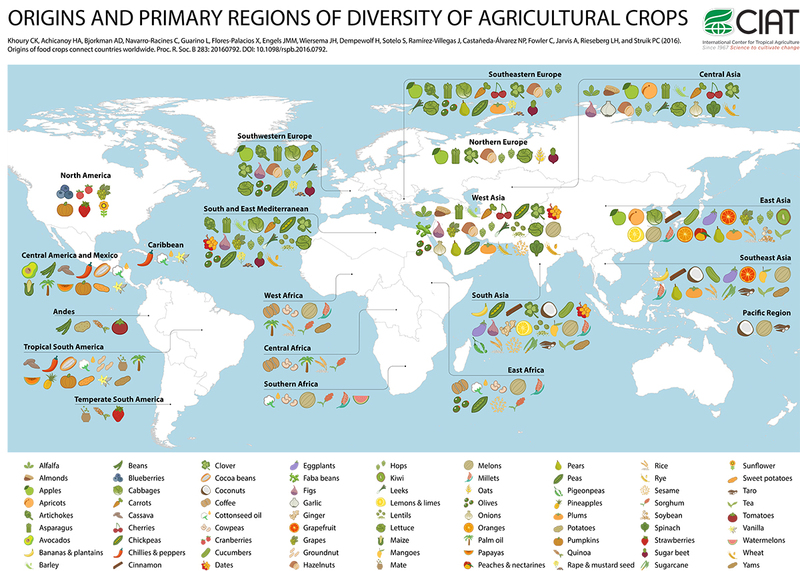 Click here to visit interactive maps and graphics that allow you to explore the geographic origins of our food crops and discover how important these “primary regions of diversity” are to our current diets and agricultural production areas. Map by CGIAR: Khoury CK; Achicanoy HA; Bjorkman AD; Navarro-Racines C; Guarino L; Flores Palacios X; Engels JMM; Wiersema JH; Dempewolf H; Sotelo, S; Ramírez-Villegas J; Castañeda-Álvarez NP; Fowler C; Jarvis A; Rieseberg LH; Struik PC. 2016. Origins and primary regions of diversity of agricultural crops. CIAT Infographic. Cali, Colombia: International Center for Tropical Agriculture (CIAT). 1 p.
Where are the world’s staple food crops grown today? … how a blue pigment changed the world. These Pacific waves are Prussian blue. 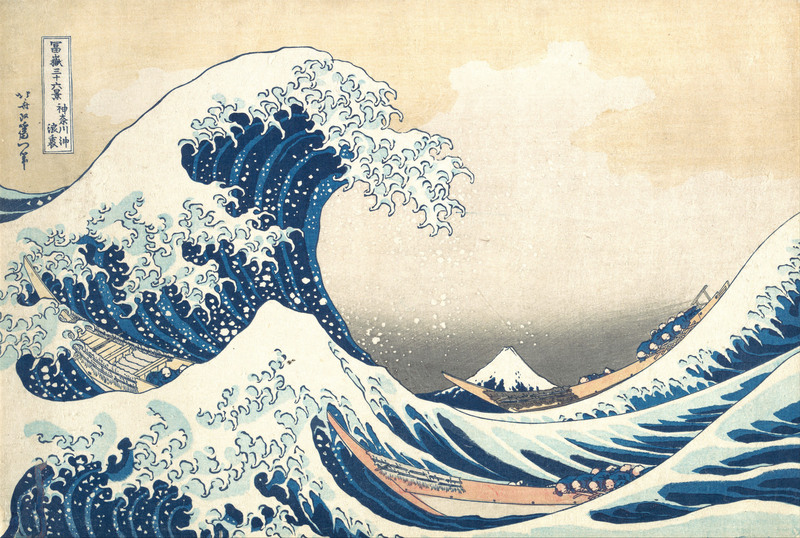 Print by Katsushika Hokusai, courtesy the Metropolitan Museum of Art. Public domain! OK, so there are blue pigments, but no blue birds? … Kenyans of Asian descent are an official tribe. 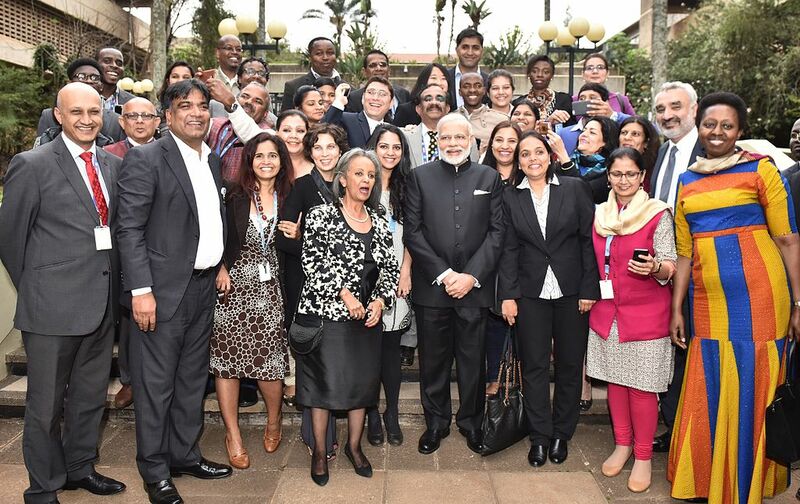 The Prime Minister of India, Narendra Modi, (center) visited the University of Nairobi, Kenya, in 2016. Today, the thousands of Kenyans of Indian descent are the nation’s 44th recognized tribe. What is the history of Asians in East Africa? 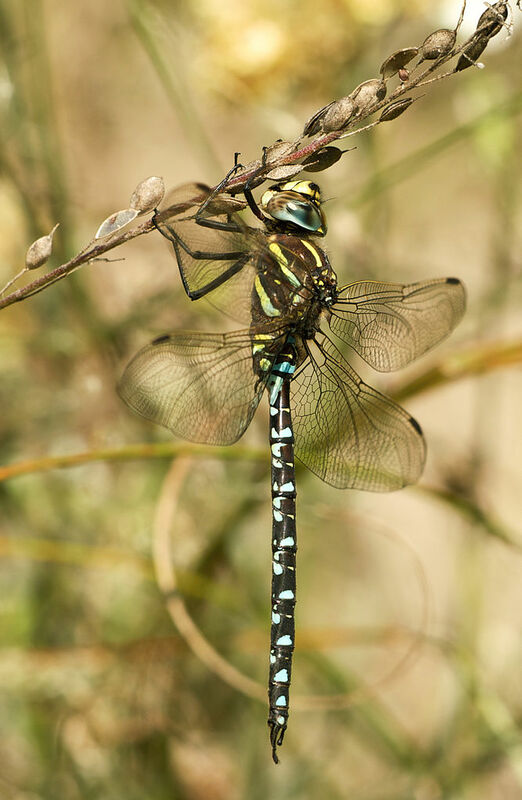 … female dragonflies fake their own deaths to avoid males. The female of this species, the common hawker, will crash to the ground, then lie motionless and upside down in order to avoid mating. Where did our bioblitzers see the most dragonflies? … Uganda’s policy toward refugees is the best in the world. 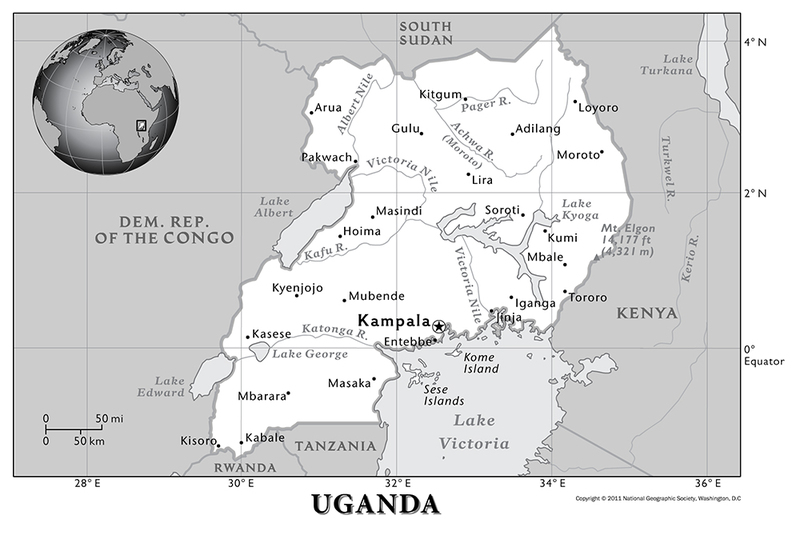 Customize, download, and print a map of Uganda. What is everyday life like for a student in Uganda? … a museum is offering about $15,000 per character to anyone who can decipher this ancient Chinese script. 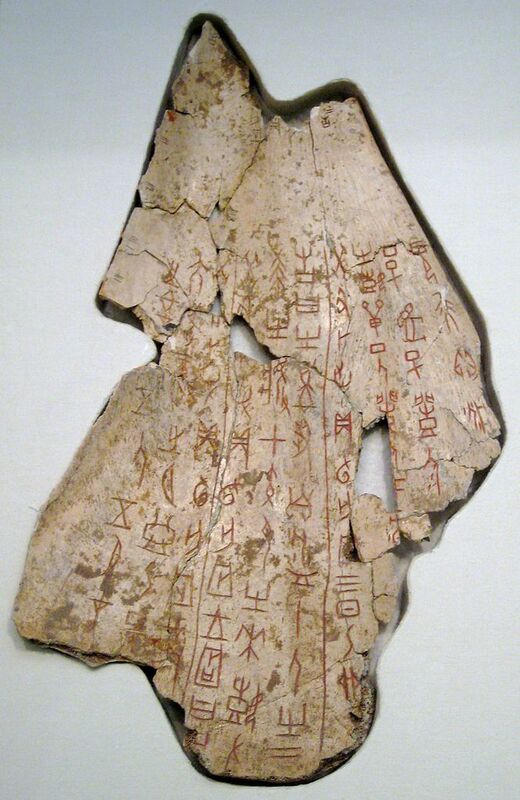 This beautiful “oracle bone script” is the earliest version of written Chinese, carved in about 1200 BCE. Chinese is one of the oldest still-used languages—and one of the most contemporary. 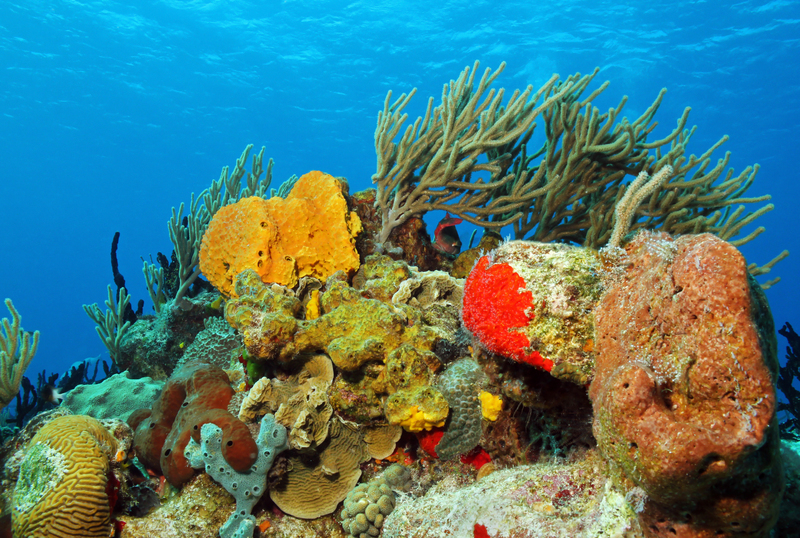 … Mexico is launching a strategy to insure a coral reef. This beautiful coral reef off the Yucatan Peninsula will be protected under an insurance policy in which the premiums will be paid by local hotels and government, and money to pay for the repair of the reef will be released if a storm strikes. How are our explorers working to conserve coral reefs? … what happens when girls in one of the world’s largest slums start building apps. Girls in the Dharavi area of Mumbai are using skills learned in an after-school program to build apps that address community issues such as water scarcity, public safety, and hygiene. 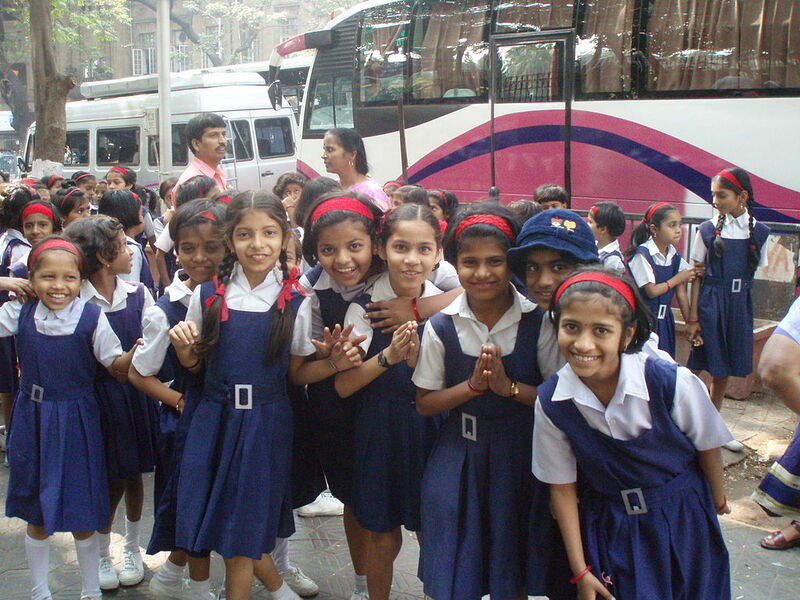 These Mumbai schoolgirls are not the Dharavi coders! Get your students coded for success! … how munitions disposal has impacted the U.S. landscape and health of its citizens. 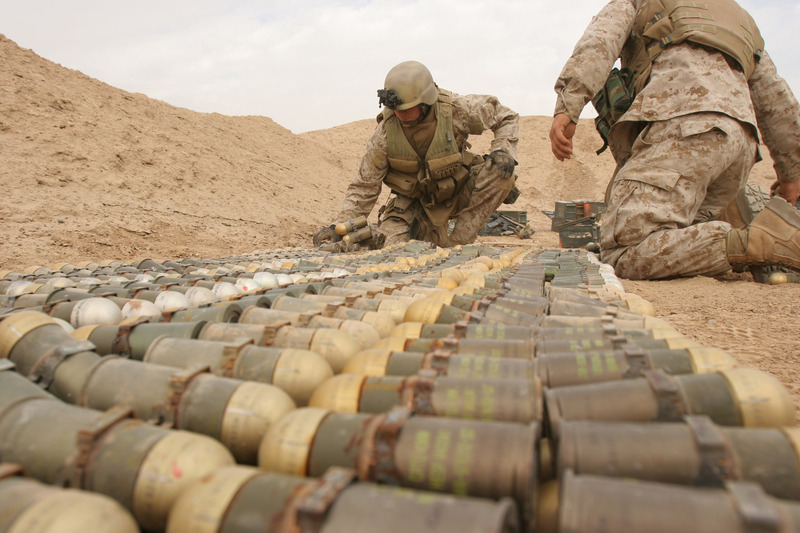 U.S. Marine Corps and U.S. Army explosive ordnance disposal technicians arrange unexploded ordnance for demolition at Camp Fallujah, Iraq. Unexploded ordnance is also disposed of in the United States. How have 100-year-old munitions defined the landscape of France’s Zone Rouge? 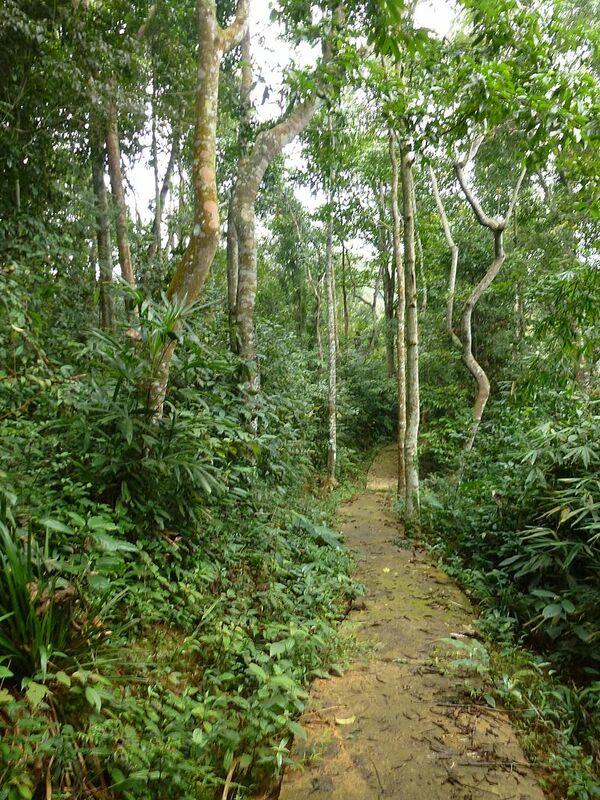 … Australia is rolling back conservation regulations, but Vietnam is investing in its forests. Vietnam’s lush vegetation is being protected by an innovative program in which hundreds of small forest owners are joining forces to produce sustainable acacia used in furniture around the world. How does forestry contribute to Vietnam’s economy? … the world’s oldest smiley face may decorate a Hittite jug. This cheerful, 1,700-year-old artifact was discovered in Turkey, near its tumultuous border with Syria. What clues does pottery provide about ancient cultures?